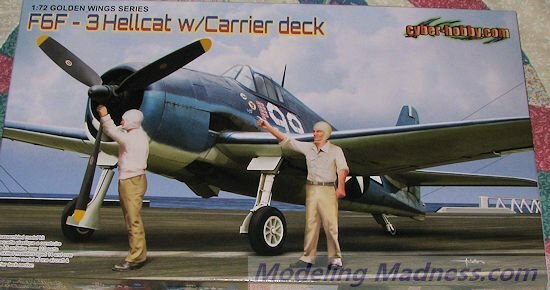 This is, I believe, the third boxing of the Hellcat by Cyber-hobby, with the first two being an F6F-5N and an F6F-3. As with the previous boxing, the kit is loaded with options. You get separate open and closed canopies. You can have the wings folded if you wish. The tail hook can be modeled extended or retracted. You can build the kit with the wheels up. A new addition to this kit is a two piece flight deck section that will look great with your finished model. A nicely detailed engine and accessory section is provided. In the cockpit, a photo etch brass harness is included. There are also things under wings. A centerline tank, dual bomb racks and rockets are available. Now one does need to do their research on this as early -3 Hellcats had no ability to carry bombs or rockets and I believe that rockets were a late production addition. For the longest time I thought that rockets were only on the -5, but that is not the case. As always in wartime production, as upgrades became available they were added. Holes in the lower wings need to be opened to attach these items so there is no need to be concerned about filling pre-opened holes. I also like that the ailerons are separate items. When the wings were folded, the control rods were disconnected and so the ailerons did not remain in the neutral position. 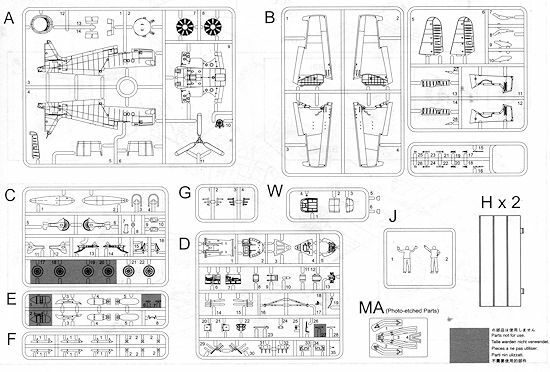 Instructions are well drawn and have the usual Gunze and Model Master paint references. There are markings for four aircraft in this one, all of them in the tri-color paint scheme and all with pretty much the same camouflage pattern. You get aircraft from VF-9 aboard the USS Essex in 1943, VF-6 aboard the USS Intrepid in 1944, VF-25 aboard the USS Cowpens in 1944 and VMF(N)-534 in 1944. This latter unit was based on Guam after the re-capture of the island. 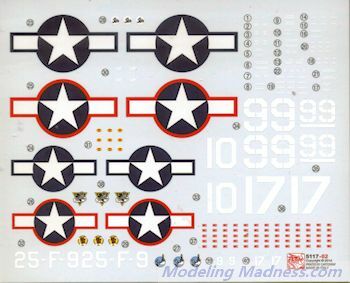 The decal sheet is nicely printed and offer all the markings you need. I should mention that I'm pretty sure that only the Essex plane would have the red surround markings as they were overpainted in September of 1943. I realize that these things take time, but I doubt it would take into 1944 to do it. It is nice to see this kit being reissued and the addition of the deck base makes it particularly desirable.